Cool Jerk » Archive » Another day, another comic! And the clock starts… NOW! At Darlene’s suggestion, I spent the last day of September and the first day of October creating another 24-Hour Comic. 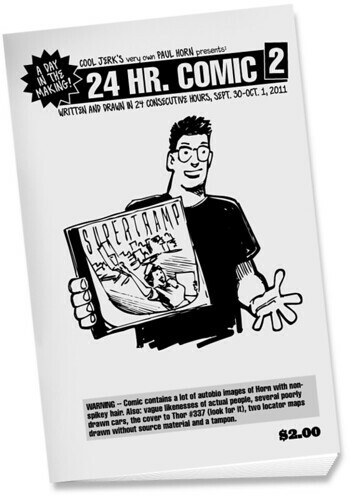 This wasn’t my first 24-Hour Comic. I created one in 2007 (featuring Doc Splatter, .pdf available here) and it was grueling. This year’s was no easier. I went the autobio route and made a comic that discussed at length the myriad of musical influences that have shaped my tastes since childhood. I think this was at the halfway mark (8:00pm). Many people who accept the challenge flock to neighborhood comics shops on the designated day (this year it was Saturday, Oct. 1) and participate amongst their peers. Me? I’m a recluse when I create comics. I like the solitude and things like “conversation” and “camaraderie” just get in my way. I’m in it to win it! So like the comic I created in 2007, I worked at home. I started at 8:00am on Friday and had the final page scanned into the Mac a few minutes before 8:00am Saturday morning. 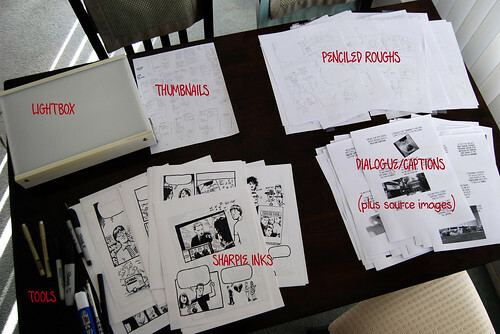 My process: Similar to how I create Cool Jerk, I would write the dialogue and captions on the Mac first, then print those pages out and rush them over to the lightbox. 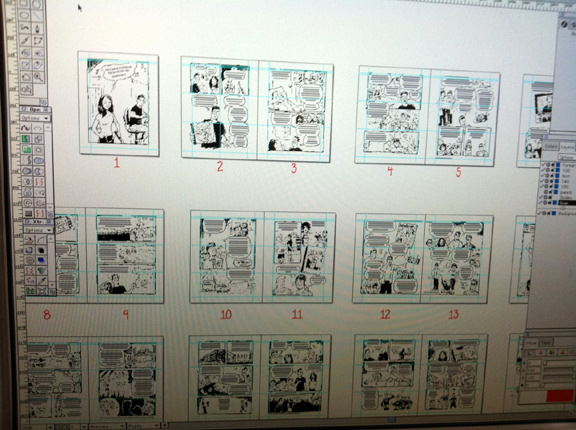 There, I would quickly pencil the layouts. Once I was happy with the page, I’d make any necessary changes on the Mac and reprint the dialogue and captions and then ink the final artwork. I used Sharpie markers and Sigma Micron pens for the inks (I did the same in the 2007 24-Hour Comic). If I had used a brush and ink (like I do for Cool Jerk), I’d have surrendered after the third or fourth page. You maybe wouldn’t think so, but it takes A LOT more muscle control to use a brush. 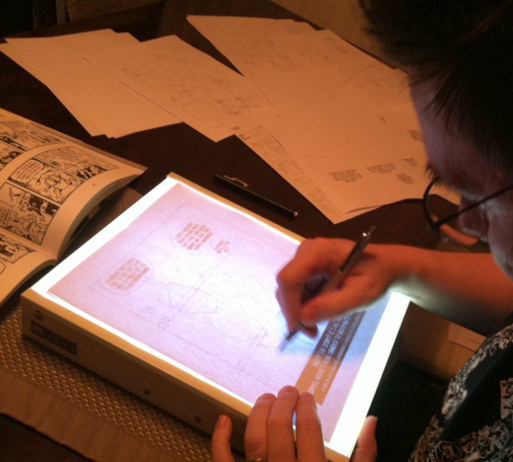 Hell, I get hand cramps when I ink Sunday-sized Cool Jerk strips, which usually takes about three hours. I’m happy to say I didn’t need to do any significant white-out corrections, and any major goofs were quickly edited either with Pentel correction fluid or in Photoshop. How the book looked once all the pages were scanned. So that’s the artwork. As far as the story, you’ll have to read it yourself. I admit it won’t be nominated for an Eisner Award anytime soon, but I’m pretty happy I wrote a cohesive story and illustrated it in one day. (And Darlene teared up when she got to the end.) As I said, it’s autobiographical, so it features Darlene, my sister, a fair chunk of my friends, many musical performers and chronologically accurate depictions of my hair. Plus two locator maps. And several poorly drawn vehicles. And a tampon. BONUS! I live-Tweeted the whole day, at the top of each hour. Take a rare glimpse into the creative process! That’s impressive! I tried doing a 24 hour comic a couple years ago and I got so far behind I never made up the time and quit. But you did two, so you’re my new hero! Can’t wait to see a copy of the comic! 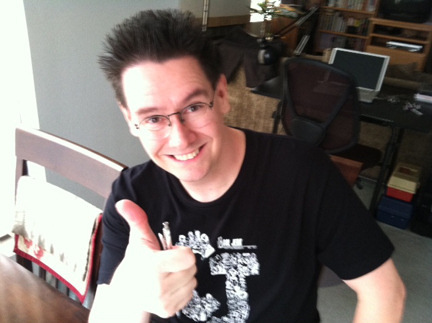 Happy (belated) Birthday Paul! Your cake was so cool, especially the logo! 24 pages about Supertramp??? But seriously, that’s a hell of an accomplishment! Also can’t wait to see it!